WBA and IBO middleweight title holder, Gennady Golovkin will clash with IBF champion,David Lemieux for this unification fight on Saturday, October 17th at Madison Square Garden, live on HBO at 9:00 PM. Headlining in his first Pay-Per-View debut, Golovkin looks forward to putting on an amazing show for fans. 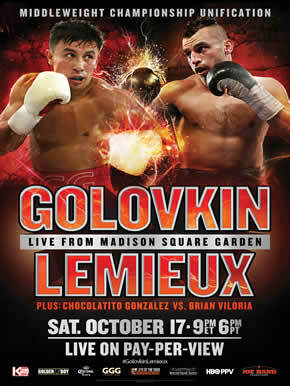 Road to Golovkin/Lemieux debuts Saturday, October 3 at 12:15 AM (ET) on HBO. What to Watch in April! HBO / Cinemax New Year’s Free Preview Event!